outcast by the west, Colas exploit Indians through aamir & sachin ! There is a term used in racing at sea—sail close to the wind—which implies doing something which is dangerous, just about legal, or acceptable. It comes from real life out there on the waters, when you try to move forward almost right into the direction the wind is coming from, using all your skills to not only stay upright, but also to make some headway while others have given up. It also implies using illegal methods, when nobody is watching, to reach your destination. Of late, that’s what seems to be happening in the world of soft drinks and those who would use every method possible to try and make us drink more and more of the sweetened, coloured, carbonated water—never mind the larger impact on health, society and now in the latest revelations, causing cancer. The two largest players in this, PepsiCo and Coca Cola, are globally in a race to try and tackle dropping sales of “soda pop” in developed countries and take a lead in what they would like to call nutritive health drinks and foods as well as water, but here in India, it appears to be more and more pressure on making these same “soft drinks” some sort of aspirational destination, if one may use that turn of phrase. The reason for this is not difficult to discern—increasingly, it is politically incorrect, like smoking, to guzzle “soda pop” in front of impressionable youngsters. In addition, role models in American society will think more than twice now, before they even dream of endorsing all sorts of junk food, cancer colas and other packaged or processed edibles of any sort. Obesity, diabetes and now cancer are directly linked to these sweet coloured sugary liquids. In addition, actual sale of soft drinks is frowned upon in and around schools, either by way of legislation or by way of local social pressure. Michelle Obama, wife of the American president, leads a nationwide programme called “Let’s Move” (http://www.letsmove.gov/) with complete government support and participation, tag-lined “America’s Move to Raise a Healthier Generation of Kids”, which has in it’s second year already made it clear what is good food (fruits, vegetables, whole grains, lean proteins and low fat dairy, mainly) and what is not. On the other hand, here in India, the authorities appear to be going out of their way to help the same processed food industry, especially the soft drink industry, with all sorts of help to take sales further. One not so subtle step is the way in which role models in India are actively encouraged to endorse soft drinks—whether by way of providing tax exemptions (example: Sachin Tendulkar’s Ferrari, which was sought to be brought in duty-free, was supposed to be a ‘gift’ from Michael Schumacher) or providing them with honorary ranks in India’s Armed Forces (MS Dhoni and Sachin Tendulkar again) or by not levying taxes pertaining to advertising on blatant product placements for branded soft drinks in Indian movies (almost by every movie star). Put it this way, when you see Sachin Tendulkar or Shah Rukh Khan’s fancy new cars and homes in Bandra, Mumbai, what do you see? I don’t know about you, but many of us who have friends and relatives undergoing treatment for cancer at the nearby Leelavati Hospital, also in Bandra, Mumbai, see bottles and bottles of the cancer-causing Coke and Pepsi. 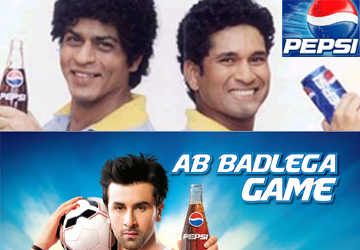 Endorsed by these worthies and their friends in the cricket and film industry, these cancer colas and their champions, need to be removed from our advertising horizon, and soon. Or, like tobacco products, they need to carry health and safety warnings. Not endorsements by our stars and heroes. So the question that comes up next, automatically, is this—what is the liability that those who endorse these soft drinks have? Should the people who reaped huge personal benefits by advertising, inducing, tempting and otherwise persuaded millions of others to buy and consume something that they knew was dangerous as well as unhealthy, be held financially responsible for this? The answer is there, to be seen in the Companies Act, in the Food Safety & Standards Act and from there onwards in the Indian Penal Code. And the answer is also there as an extension of the question—did the people who were part of the larger structures which produced these endorsements not know that the ingredients in their products, as well as the products itself, caused cancer? Or were simply bad for a nation’s future generations? The problem is with the laws in India and the way global MNCs as well as now even Indian MNCs keep to the right of it or on the border, in a manner which would never be permitted or acceptable in developed countries. There is, however, hope. Government policy of retrospective liability under laws brought out subsequently, as with the Finance Bill this year for Income Tax issues, brings some hope. “I didn’t know” is not going to be an admissible defence. Because, fact remains, high sugar content sweet coloured carbonated waters are not good for us, or our children.